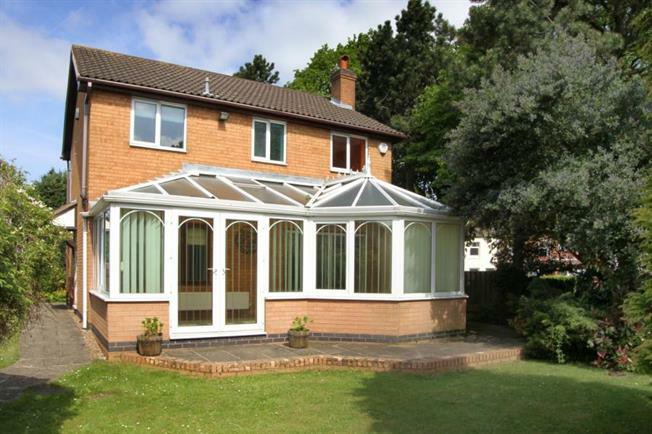 4 Bedroom Detached House For Sale in Chesterfield for Guide Price £265,000. This stunning four bedroom detached house on a huge corner plot is perfect for the growing family! With double detached garage for all the storage and car tools you could ever need! The property boasts a large kitchen/diner along with a separate dining room, large living room and a large conservatory built along the rear of the house. All ready for the new owners to add their own stamp and touch to the property. With heaps of room for entertaining the whole family and enjoying the summer sun and cold winter nights! Upstairs the property has four really good sized bedrooms with plenty of storage for those clothes, bags and general clutter! The family bathroom is complete with a fully fitted three piece white suite with over the bath shower. The large wrap around gardens allow privacy all the way around the house with ample space for trampolines, toys and sun loungers! The double width detached garage, complete with double driveway is enough to send the car fanatic crazy! Bolsover is a small town approximately 6 miles from Chesterfield. It has a range of local amenities including shops, bars, schools and parks and most notably the 17th Century Bolsover Castle, which is a great day out for all the family. Excellent commuter routes via A617 to Junction 29a of the M1 motorway network along & within easy reach of Chesterfield railway station providing easy access to Sheffield, Derby & Nottingham. This property just keeps on giving and really is one to be viewed! Call Blundells NOW!